Al Pittampalli is the author of two books that combine research and storytelling to help individuals and organizations adapt to a fast changing world. 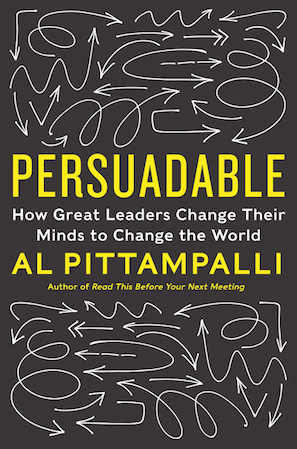 His most recent book, Persuadable: How Great Leaders Change Their Minds to Change the World (HarperBusiness), was a Wall Street Journal book-of-the-month selection. His first book, Read This Before Our Next Meeting: The Modern Meeting Standard for Successful Organizations (Penguin), now out in over 100K copies, was the most popular kindle book in the world during the week of its release. It’s been translated into five different languages. Al has helped organizations like NASA, Biogen, IBM, Hewlett Packard, and Abbot Labs, transform their organizational cultures. Al is a writer for Harvard Business Review and Psychology Today. He has been featured in Forbes, NPR, CBS, Entrepreneur, and more.